Nine adult-specific bacteria designed specifically with a higher percentage and concentration of Bifidobacteria for a seniors healthy intestinal flora. Nine adult-specific bacteria at an appropriate strength designed specifically with a higher percentage and concentration of Bifidobacteria for a seniors healthy intestinal flora. Microbiotics are the beneficial friendly bacteria that occur throughout the digestive tract. They are absolutely essential for proper digestion, strong immune function, and overall health. People over 50 generally need a larger quantity of beneficial bacteria and several varieties of Bifidobacteria for optimum bowel health. The specific strains used in Adults 50+ Blend have been specially chosen for their value to seniors health - and have been formulated to the viable count needed to fully support seniors needs. Why do we need Microbiotics? When the ratio of good bacteria to bad is lowered, problems begin to arise such as excessive gas, bloating, intestinal toxicity, constipation and poor absorption of nutrients. Whilst it is true that non-beneficial bacteria are naturally occurring in the intestinal tract, problems begin when their growth goes unchecked. Microbiotics play an especially important role in keeping in check the pathogenic bacteria that cause disease. A healthy lower intestine should contain at least 85% friendly bacteria to prevent the over colonisation of disease causing micro organisms like E.coli and Salmonella. People over 50 generally need a large quantity of beneficial bacteria and several varieties of bifidobacteria for optimum bowel health. High concentrations of acidophilus in the absence of bifidobacteria may tend to cause constipation. This formula has been specifically designed with an emphasis on the particular bifido strains necessary for health and longevity in seniors. This blend is also indicated for adults under the age of 65 who are experiencing lower bowel symptoms such as chronic diarrhoea and / or constipation, often indicators of more serious conditions. The specific strains used in Advanced Adults blend have been specially chosen for their value to lower bowel health and have been formulated to the appropriate viable count. Lactobacillus casei: a bacteria commonly used for milk fermentation and has shown to be helpful in treating diarrhoea caused by antibiotics and viruses. Lactobacillus rhamnosus: one of the most important microbiotic strains for the health of the adult digestive tract from the mouth to the small intestine. Especially beneficial in inhibiting the bacteria involved in vaginal and urinary tract infections. Bifidobacterium breve: colonises the large intestine and is a producer of lactic and acetic acids that inhibit the growth of undesirable bacteria. It enhances immune responses against various pathogenic antigens and has been shown to repress the growth of ulcer-inducing bacteria. Bifidobacterium longum: colonises in the intestinal tract, it breaks down bile salts, helps to synthesize B-complex vitamins and stimulates the immune system. Lactobacillus acidophilus: one of the most prominent micro-organisms found inthe small intestine. It produces lactic acid which inhibits yeast growth, as well as natural antibiotics which enhance immune functions. Streptococcus thermophilus: a transient probiotic from dairy origin. Producing large quantities of lactic acid it limits the growth of unfriendly bacteria and helps in the prevention and treatment of diarrhoea. To maintain healthy intestinal and oral flora - Take one capsule per day on a full stomach. As an intensive treatment - Take three capsules per day on a full stomach when suffering from intestinal disorders. Refrigeration ensures maximum potency & stability. 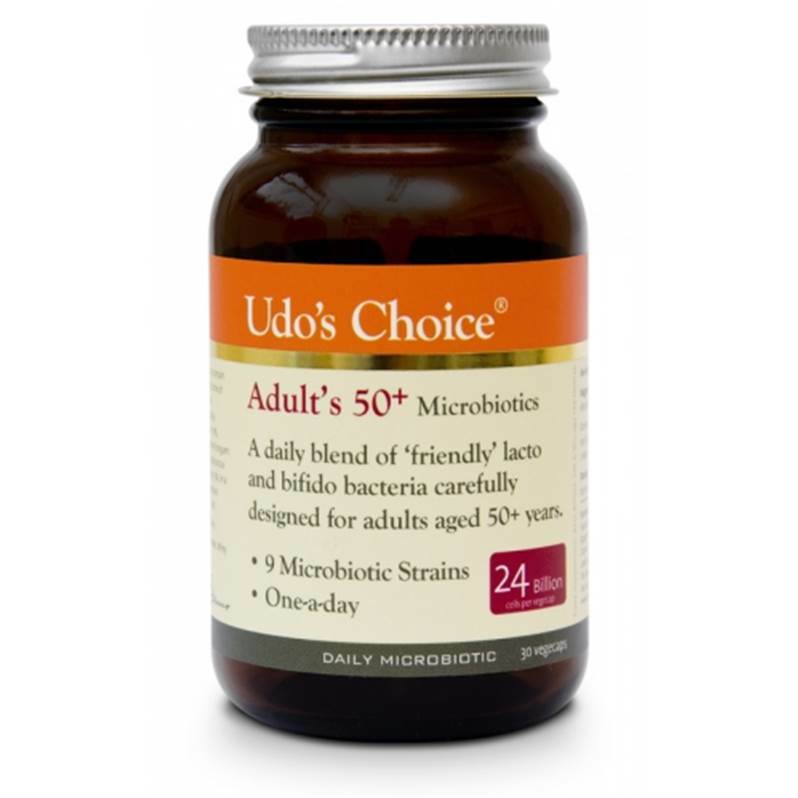 Udo's Choice Adults 50+ Blend Microbiotics can be left unrefrigerated for short periods of time and may be frozen.